Need to do some goal housekeeping? Here's now you can edit, complete, archive, or delete Coach goals that you've created. Managers can also take all of these same actions on the goals of their employees. This level of control is useful in ensuring your team members are writing effective SMART goals and working towards the right objectives. Review your employees' goals at any time and make adjustments to guide them in the right direction. From the Goals section, find the goal in the list you wish to edit. View the goal and click on the pen icon to the right of the Goal Description banner. The window will pop up to allow you to modify the title or goal description. Click Save Changes to complete (or the X in the top right corner if you've changed your mind). If you're a manager in Coach, you probably already know that you can create goals for your team. You can assign the goal to employees when you create it and then at any time after that as well. Just click Edit to add or remove any of your direct reports by selecting/deselecting the checkbox next to their name. First and foremost, congratulations on accomplishing your goal! We're sure you've been working hard to achieve it so now be sure to mark it Complete. 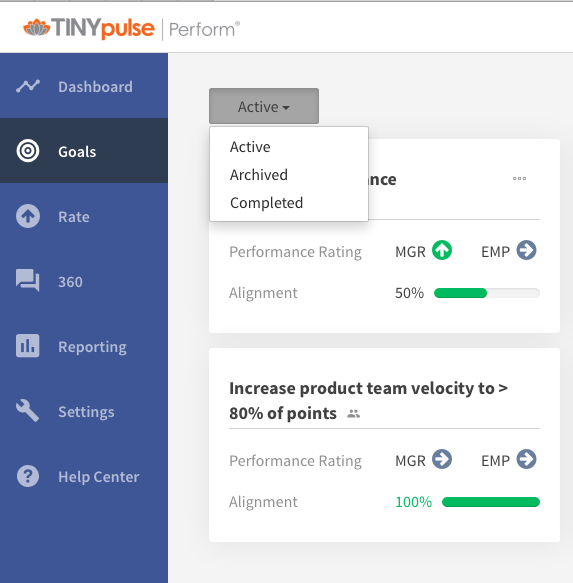 Completed goals retain the full rating, comment, and to-do list history, you just won't be prompted to rate it any more. It will live in the Completed Goals section and can be accessed at any time. Archiving is the best solution for goals that you don't want to pursue any longer, but still want to keep the history. Archiving goals will put them in an inactive state while storing all of the data and trending. From the Goal Description screen, click the middle button to archive. The goal will now be listed in the Archived Goals section and you can view it as you would active goals. Just use the top left filter to see all of the goals in the archive. Before you delete, think really carefully about the goal's history! There's no way to recover a deleted goal, so make sure you're 100% positive that you don't need it. See the section above to Archive if you're having second thoughts (which we think is the better solution). If you're positive, click the third, trash can button in the Goal Description panel. If you need to reactivate an archived or completed goal for you or an employee, no problem! Go to the Goals section. Find the employee who needs a goal reactivated. If you're doing this for one of your own goal, skip to step 3. Click the dropdown menu and go to either the Archived or Completed section depending on where the goal is located. Select the three dots on the right side of the goal card and three options will appear. Reactivate, move the goal from the Completed section to the Archived section or vice versa, or Delete the goal.